As early as the main menu, Anarchy Reigns presents itself with a quirky roster of likable characters whom are each uniquely designed for the game. The game’s single-player campaign is split in two halves. The player can take on the role of newcomer Leo, or returning character from Platinum’s first title MadWorld, Jack Cayman. Both sides of the campaign follow similar paths and occasionally features points of intersection where the other side of the campaign can be seen. This is a very clever idea for other kinds of games but for this in particular, it just feels as if the length is being padded. There are main missions which progress the player through the campaign and then there is the side missions. Judging by the amount of enemies you kill, you will gain points. The side missions are limited in entertainment but they are, for the most part, the meat of the campaign considering you almost have to go through them more than once in order to gain enough points to unlock main missions and more side missions. This can get more tedious than enjoyable very fast. This method of grinding through side missions to earn more points unfortunately exploits the glaring missteps in the mission design. Main missions on the other hand usually involve defeating a specific enemy, typically a major character in the campaign and someone who will be unlocked for the game’s multiplayer. For most of the campaign the player will be assuming the roles of either Jack or Leo, however, brief points in the campaign allow for secondary characters to be played. I like this idea simply because it leaves room for more variety and mix-ups in the gameplay, especially if you don’t feel confident about heading straight into the multiplayer. There’s about 10 hours of content in the single-player, which is surprising for a beat ‘em up so if you can stomach the combat, there’s lots of fun to be had. The multiplayer, which is Anarchy Reigns’ selling point can be even more frustrating than the single-player more times than expected. It takes the already flawed combat and exposes even more flaws. A match with more than one single opponent can lead to constant hammering with little to no way of defending yourself. The fact that there is no lock-on also makes it difficult when more than one opponent is present. Not to mention this game’s unforgivable camera angles, especially in smaller areas where you must fight larger enemies. The game’s 16 player character roster are at the player’s disposal (Provided that you unlock them in single-player first) but one or two have significant advantages over the rest. For example, the robot Garuda had a grab attack that grabs up to two players at once. This makes him virtually invincible. There are numerous multiplayer modes such as Tag Team, Death Match, & Survival, however as mentioned before, its more frustrating than satisfying when there is balancing issues with the characters. 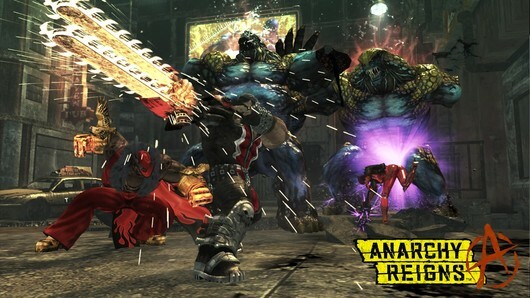 By no means is Anarchy Reigns a bad game, although it is a game where aspiration and execution don’t meet very well. Sadly, the story is weak and forgettable while the multiplayer is rage inducing. The various problems with the gameplay make the combat seem monotonous and pointless after a while. Fortunately, there is just enough here for brawler fans, or fans of Platinum’s previous work to be a moderately enjoyable, but not memorable, experience. At the time of this review, Anarchy Reigns is $30 at retail. 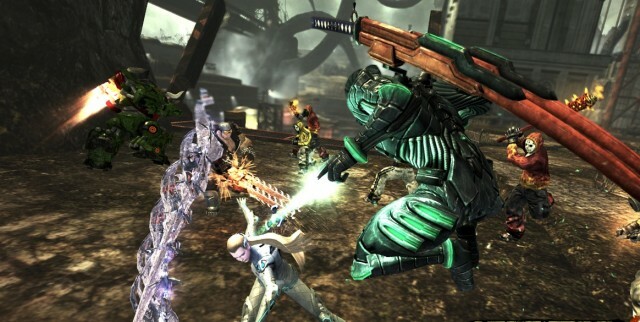 The Xbox 360 version was used for this review.